Meet the daredevils who barreled, boated and even bicycled to fame by tempting the mighty Niagara. 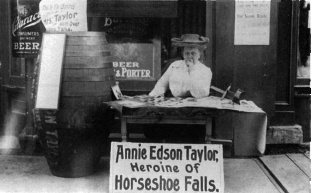 There was Annie Edson Taylor, the widowed schoolteacher who became the first person in history to go over the falls in a barrel and live to tell about it. She was dubbed the Heroine of the Horseshoe Falls. In recent years, there was Steven Trotter, an aspiring stunt man who used a souped-up pickle barrel and packing used for nuclear devices to challenge the fall's raw power. 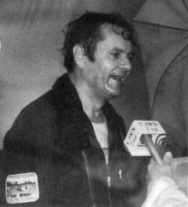 And there was John Paul Munday, a former skydiving instructor who conquered the falls despite his intense fear of water. 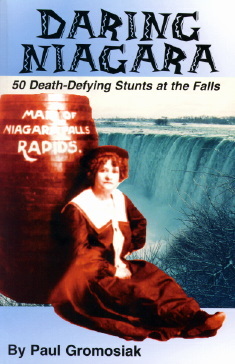 Just as millions of tourists clutch the railings and stick their heads into the cool mist, Niagara Falls historian Paul Gromosiak is out with Daring Niagara: 50 Death-Defying Stunts at the Falls, which offers a nail-biting look at the men and women who thumbed their noses at nature. The riveting text is filled with photographs that chronicle more than a century of daring feats. Paul Gromosiak, a former teacher in the Niagara Falls Public Schools, has written nine books on the falls, and is a popular speaker on the lecture circuit.